We believe in the open fellowship. We believe that the church exists for others, not for its members alone; that it is entrusted with a divine ministry to all people in body, mind and spirit. Directions from the centre of Blantyre: proceed to the 'Clock Tower Roundabout' opposite the Petroda Filling Station and take the exit up the hill and under the railway bridge towards Wenela bus station and Mwaiwathu Hospital (the old Chileka Road). Pass both the bus depot and the hospital on your left hand side and look for the next turning on your left. The next turning is signposted 'Blantyre Mission' and 'National Monument'. Take that left turn and you will see St Michael and All Angels church directly in front of you. At the top of Victoria Avenue (facing Mount Soche Hotel) turn left onto Glyn Jones Road towards the Hong Kong restaurant. Continue on Glyn Jones Road past the Hong Kong Restaurant on your right and the road to Ryalls Hotel on your left. Proceeding along Glyn Jones Road you will enter Namiwawa (beware of the speed bumps) and past a Puma service station on your left. Continue along Glynn Jones until you meet a sharp right turn with a large number of signposts arrayed in front of you. Take the tar road to your right and not the dirt road to your left. Follow this road (The Chilimoni Ring Road) past several twists and turns as you enter Chilimoni. When you reach a T-junction turn left. Proceed downhill on this road past the graveyard on your left until you see a large wall and a church building behind it on the left. That is Michiru CCAP. 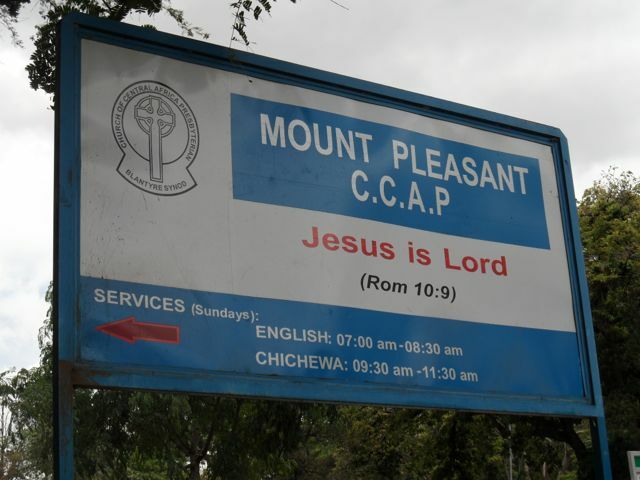 Mount Pleasant CCAP, near the city centre in Blantyre. See below for details. For more information, contact the church office Tel. 01 878 326 or email mountpleasantccap@yahoo.com. Directions to Mount Pleasant CCAP from the centre of Blantyre: Follow the main road in the centre of Blantyre, Victoria Avenue, downhill and away from Mount Soche Hotel. Continue until the road reaches it's lowest point as you cross over a river. As you then proceed uphill you will see Mount Pleasant CCAP (signposted) on your left opposite the ice cream parlour on your right. 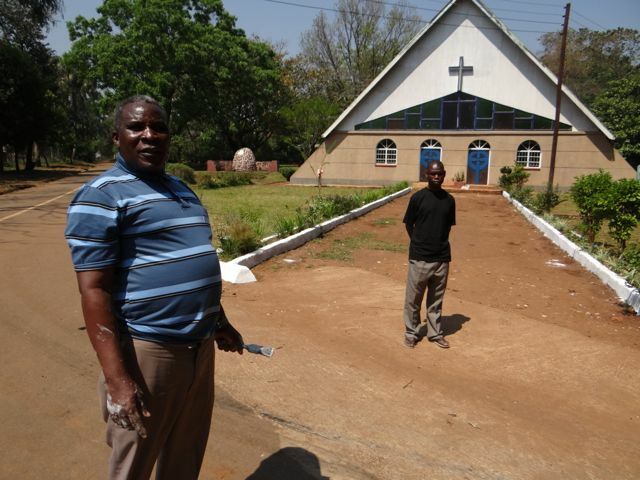 This church is close to the centre of Blantyre. Mount Pleasant CCAP. Picture taken from the main road between the city centre and Sunnyside. At the top of Victoria Avenue (facing Mount Soche Hotel) turn right onto Glyn Jones Road. Proceed downhill until you reach the first roundabout and turn left onto Zalewa Road in the direction of Chileka Airport / Mwanza / Lilongwe. Continue a long way downhill. If you know this road then start looking on your left hand side for the Mlobwe CCAP sign on your left about a mile before the main Kameza roundabout. If you do not know this road then you may wish to continue until you reach the main very large roundabout (with fuel station) where you should go right round and then head back uphill in the direction you came. After 'about 1km' you will see the Mlobwe CCAP sign on your right hand side. Turn right there for the church. Proceed towards Blantyre and at the Kameza Roundabout turn right for the main road (Zalewa Road) into Blantyre. 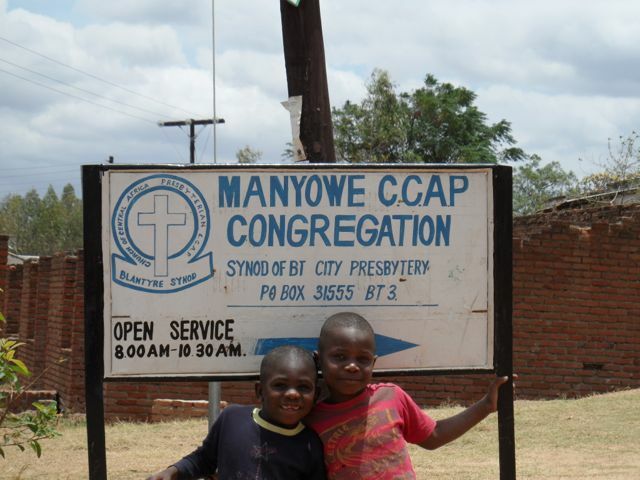 After 'about 1km' you will see the Mlobwe CCAP sign on your right hand side. Turn right there for the church. The three prayer houses also have their own two-hour services every Sunday. Just off the Chikwawa Road. For directions please see the individual church paragraphs. Mlombwa CCAP - 7.00 am English service (Blantyre, Chileka Airport side of town). Zomba CCAP is in the centre of town. It is near the police station and the golf course just off the main road. You can see it from the main road on one of the other main roads that leads uphill towards Zomba Plateau and Ku Chawe Inn. If you have any doubt about it's location just ask a local pedestrian. This is the ideal church service for people staying at the base of the mountain at Likhubula House or Likhubula Forestry Lodge. Even those staying overnight on the mountain at Chambe Hut, France's Cottage, Lichenya Hut or the CCAP cottage can get to church. The other mountain huts are too far. If you are staying on the mountain you will have to rise before dawn (for the English service), but if fit and enthusiastic you can be back up on the mountain in time for lunch. from the Forestry Lodge or from Likhubula House (CCAP) or from the Forestry Lodge head downhill on until you meet the main road. Turn left. After about 5m you will cross the bridge. After another approximately 50m turn left again (the CCAP is NOT signposted here). Then travel 100m to the church. 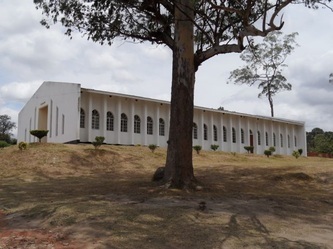 The church is located at Mulanje Mission Hospital on Mulanje Mission. 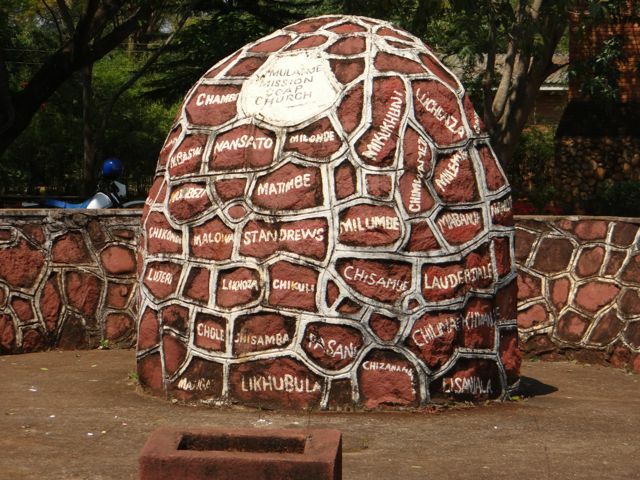 Ntcheu is a town located between Lilongwe and Blantyre. It is on the main road between Malawi's two main cities. It is an ideal place to break your journey. Ntcheu Boma (town) is located within the Blantyre Synod of the CCAP even though Ntcheu District is in the Central Region of Malawi (most of the Central Region comes under Nkhoma Synod of the CCAP). From the south (e.g. Blantyre) on route to Lilongwe as you enter the town of Ntcheu you should look out for a signpost on the left to the police station and there is a sign at the same left turn to the CCAP. Take that turn to the left. The church is only a short distance away. If in doubt ask. If you miss the turn off to the left and find yourself in the main trading centre of the town or you pass a petrol station then you know you have gone too far. Turn round and after you have left the main trading centre the signposted turn off will be a short distance on your right. From the north (e.g. from Lilongwe or Dedza) on route to Blantyre / Zomba / the south. You will approach Ntcheu while heading downhill into town. Pass all three petrol stations in the town and the main trading centre and then look for a sign on the right hand side of the road to the police station and also to the CCAP church. Take that right turn and the church is a short distance away. 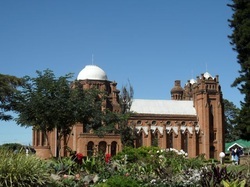 Ntcheu CCAP has 4,000 members including 8 outer prayer houses. The minister himself has responsibility for 6 church congregations (this one plus five others) which together have 22 prayer houses. For this reasons the church elders share the preaching responsibilities. 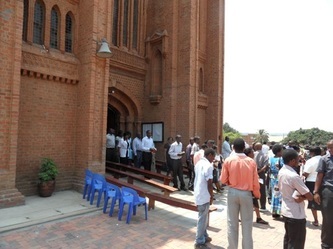 The church in Malawi has always grown more quickly than the speed at which new ministers can be fully trained. Location: On the main road through Nsanje Boma (M1). Near the Mtowe Stage. Location: Ngabu (Chikwawa District) is between Nchalo and Bangula. Proceeding south on the M1 turn left at the trading centre and carry on for 400 yards. Ask any local for directions if necessary. Minister and Contact: Rev Dr Billy Gama (Presbytery Moderator), billygama@yahoo.com, 099 444 7555 or 08888 65 117. Rev Dr Billy Gama is also minister of Alumenda CCAP. You may wish to contact the minister in advance. On the road from Limbe to Machinjiri, soon after Chikapa turn right (signposted Makalanga CCAP). After 3km on this road you will see the church on the right hand side and a primary school on the left hand side. The afternoon service is aimed at preaching, teaching and delivering to the needs of the people. As you drive uphill on the Chipembere Highway past Shoprite on your right and Kamuzu Stadium on your left - take the right exit at the main roundabout. Pass the French Cultural Centre on your left and after a few yards Chichiri Prison on your right until you reach the next major roundabout. Turn Left up Kenyatta Drive. Continue along Kenyatta Drive until you reach the next roundabout. At this roundabout turn left onto Camp Road and you will immediately see Limbe CCAP on the right hand side over a wall. Enter through the gate to find parking. From the direction of the centre of Limbe (or from the Mulanje / Thyolo direction) proceed down Kenyatta Drive into the market and then uphill through the centre of Limbe Market and past the minibuses. At the top of the hill turn right and at the roundabout in front of you continue straight on and you will see Limbe CCAP almost immediately on your right. Park inside if you find a space. Take the exit towards Independence Arch and Limbe. After passing Toyota Malawi on your right hand side take the left exit on the roundabout (as if going towards the Zomba Road). At the traffic lights turn left along the Nkolokoti Road. After about 2 miles you will pass a CCAP church on your right. After another couple of miles you will see Nkolokoti CCAP. 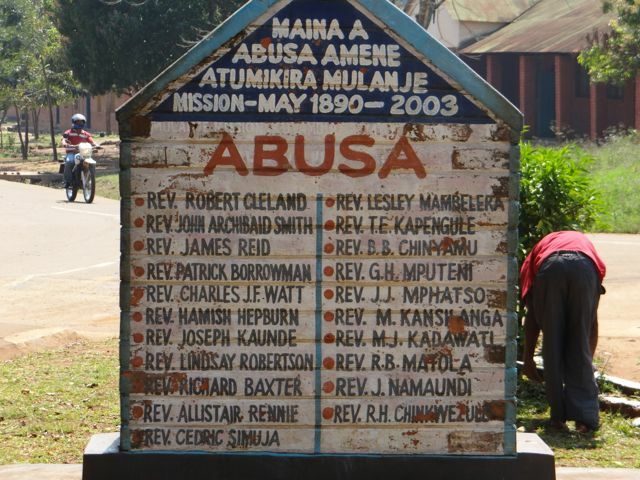 The church is located in the area behind the Shire Highlands Hotel, Limbe. It is on the same street, but uphill from, Dr Kampondeni's scan and ultrasound clinic. turn left at the top of the hill with the traffic lights as you enter the very centre of Limbe. Follow the road over the railway line and turn right following the signpost to Dr Kampondeni's. This right turn is next to The Shire Highlands Hotel. Along a bumpy (but reasonable) road you will pass the tobacco auction areas. Look out for the left hand turn signposted to Dr Kampondeni's. Follow that road and pass Dr Kampondeni's on your right. Continue uphill to the church. If in doubt, ask a pedestrian for directions. instead of taking a right and the big triangle (towards Toyota Malawi and Blantyre), turn left as if you are going past the mattress manufacturers. Continue on this main route towards the centre of Limbe until you reach the Shire Highlands Hotel on your left. Turn left at the sign to Dr Kampondeni's. Along a bumpy (but reasonable) road you will pass the tobacco auction areas. Look out for the left hand turn signposted to Dr Kampondeni's. Follow that road and pass Dr Kampondeni's on your right. Continue uphill to the church. If in doubt, ask a pedestrian for directions. From Limbe proceeding in the direction of Mulanje / Thyolo. Take the Mulanje Road at the main roundabout (not Thyolo). After crossing the railway line turn right on an earth road at Bangwe. After approximately 500 meters find Chilumba CCAP. If in doubt at any stage please ask directions from pedestrians in the area. Directions: Proceeding from the Blantyre direction continue approximately 300m beyond the passenger entrance to the airport. There you will find a trading centre called Gadaga with minibuses. Turn right at that point and the church is about 200 m from the main road. Ask a local person at this point to point out the church. 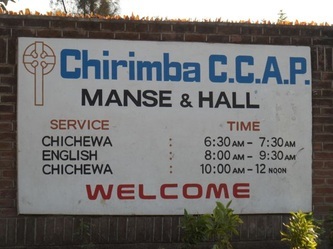 Manase CCAP is located off the Chikwawa Road. 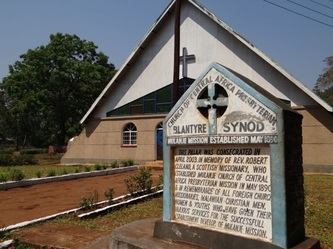 As you are driving away from the centre of Blantyre pass St Andrews Primary and St Particks Secondary Schools on your right and then pass the large Roman Catholic church on the left. Further along is a right turn along an earth road. If you are visiting please contact the minister Rev Mbeza. Assistance can be arranged to find the correct turning for the church and the route through the side roads. 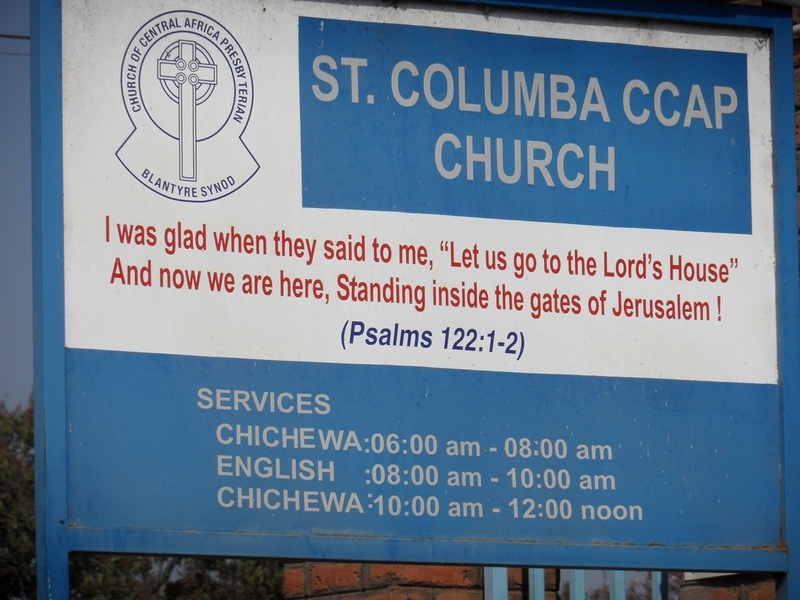 Located in Chilobwe in Blantyre's south-east, the CCAP congregation is near the Chikwawa Road. Ministers, elders, members and friends: please submit photos of your local congregation and details of Sunday Services.